Grand Strand-Voted Top 10 Beaches in the World - 2011! Located 8 miles South of Downtown Myrtle Beach in the lovely Garden City/Murrells Inlet area. Situated steps away from the beautiful, wide sandy beaches of Garden City Beach, Raspberry Kiss, Raspberry Bliss and Coral Mist are waiting to provide you and your family with a memorable, fun-filled vacation experience. These beach homes are not like your average beach bungalow. All have been professionally decorated to provide you with an upscale, luxury resort experience. With fully equipped kitchens, complete with Stainless Steel appliances and granite countertops, triple crown moldings, beautifully appointed living and dining areas as well as deluxe bedroom furniture with superior, comfortable mattresses, Kiss, Bliss & Mist offers you the best in luxury as well as quality. (Don't forget the private pools) Let Raspberry Kiss, Raspberry Bliss, and Coral Mist along with the Murrells Inlet/Garden City area, become your favorite vacation destination. Are you looking for the perfect destination wedding location or hosting a family reunion? Book both Kiss and Bliss to have 10 bedrooms and 12 bathrooms to accommodate a total of 28 guests!! We are waiting to become a part of your family and childhood memories. Come and experience the beach at its best! Book Raspberry Kiss, Raspberry Bliss and Coral Mist for your vacation and let the memories begin. COMMENTS from 2010 Summer Renters: "Raspberry Kiss"
"This was probably the most enjoyable vacation my family has ever had anywhere. Your home is lovely and the location is great. Thank You"
"Lovely time in your wonderful home"
"Your home is beautiful and comfortable. We had a wonderful vacation, perfect weather! This was our first beach vacation in 6 years. We couldn't have asked for a better place to spend it." "This is by far the most beautiful home in all of Myrtle Beach. Thank you fro taking the time to make this lovely house into a home. We can't wait to come back and enjoy this serene place once again." "I would like to Thank You for opening your lovely home for vacation rental. My family had a wonderful vacation. We enjoyed the closeness and convenience of the beach. We also enjoyed eating family meals together and cooking together in your well equipped kitchen. Thank You again. We hoped to enjoy our 2011 vacation at the Raspberry Kiss." SPECIALS !!! LOOK AT NEW RATES FOR REMAINING DATES!! SAVE money on fees and Book with Confidence directly through us! BOOKING RESERVATIONS FOR 2019 and Now 2020! Don't pay those extra 8-9% Booking Fees - Book directly through us and save $$$!!! COMMENTS from 2014 Summer Renters: "Raspberry Kiss & Bliss"
My family an I rented both Raspberry Kiss and Bliss for the weekend and it was truly another wonderful experience. The groundsman is always accessible, the homes are very clean and the decor is beautiful. These homes are really close to the beach but yet away from all the noise and traffic. The main thing I love about renting this property is that the actual owners are caring, always accessible and really knows how to show southern hospitality. I look forward to this being our regular vacation rental whenever we are in the Myrtle Beach area. Thanks again for yet another wonderful experience and the use of your home. I look forward to doing this again next year. Enjoyed every minute at Raspberry Kiss. The house was just like the pictures and descriptions listed. We had 9 people and everyone had plenty of room and all enjoyed their stay greatly. Close enough to the beach to walk, which everyone did, but the pool added just the right touch for us to relax and cool off without the sand. The Conch Cafe on the beach is a great place to eat. Good food, good service, great atmosphere. Close to Murrells Inlet, which is a must see destination. Plenty of restaurants and the Marsh Walk on the inlet is fantastic. This was, by far, the best place we've stayed. Five bedrooms, five & 1/2 baths. You can't go wrong with the KISS. Highly recommended by all. GOING BACK. Thanks Mark and Kathryn. You have a beautiful place,clean and well maintained. We'll be telling all our friends about the Raspberry house. Best vacation home stay by far! First class and five stars! Finding a property that meets the needs of my extended family for a week long vacation is a challenge. I fully went into this thinking it wouldn't be perfect, but that it would work (I have some picky/needy family members). Low and behold, each of them said, "this place is perfect for us", one by one, throughout our stay. We will most definitely be back! Except, next time, we will rent out both sides of the complex and bring more family with us! Very pleased with the layout and spaciousness of the home. With 4 families and lots of little ones, everyone had their own space and no one felt cramped. At first glance, I thought the pool was going to be too small- it looked bigger in the photos. But after using it for the week, it was honestly just perfect for us! After walking the neighborhood in the mornings, we realized this pool was actually on the larger size compared to most and also offered more privacy than others did. Dimensions are clearly listed on website, so not misled in any way... just wasn't what I envisioned. I couldn't believe how close the beach was- especially with lugging kids and stuff back and forth. We also liked that this home had a storage closet of beach chairs and beach toys to use and also store our stuff without taking them in and out of the house. Two of us that stayed in the home are real estate professionals with 25+ combined years of experience in rental property management. So we were so appreciative and impressed that the owner of the property contacted us shortly after check-in to ensure everything was as expected. We also received a visit from the caretaker that afternoon who introduced himself, so that we'd have a face with a name if we needed to reach him for any reason. Talk about first class! Lastly, I'd like to mention a few other amenities close by that we enjoyed. There is an excellent restaurant for lunch oceanfront called Conch Cafe. It's an easy walk north of the property- ate there twice and LOVED it! We used Woody's Beach Rentals to rent a golf cart and had a wonderful experience. We enjoyed taking the golf cart to Krispy Creme with the kids- it's only .8 miles away! There is also a small pizza joint, that you have to walk past to get to the beach that several of my family members enjoyed a few times. Needless to say, everything was right at our fingertips. Our family totally enjoyed our stay at Raspberry Kiss! We had 3 couples and 2 singles and we all felt like we had our own space. The place is beautiful and very clean. We loved how we were greeted with a bottle of local wine and a gift card for donuts!!! Also it was so nice to have the landlord check on us AND the owner, Kathryn to personally call us to make sure we were satisfied! It was a great vacation! Our family has vacationed somewhere on the Grand Strand almost every summer for the past 50 years, and agreed this was the best fit yet! This condo was very clean, well-equipped, and close to the beach. We rented both sides, and there was plenty of room for all 20 of us. It was a wonderful week, and we hope to return. Loved everything about the house and location. The layout of house, with the private pool was a nice break from the beach. The grill, games along with the beach chairs and toys was an added perk to our stay. The beach is just steps away with friendly hospitality everywhere we went. My husband and I and 3 other couples enjoyed this beautiful home for a pre New Year's celebration. The home is very spacious and is decorated beautifully. Each bedroom has a separate bath which allows for ultimate privacy. The living area and kitchen and dining room are so inviting and definitely accommodated our 4 couples. Everyone in our group decided we want to make this a New Year's tradition to spend it in the comforts of Raspberry Bliss. COMMENTS from 2013 Summer Renters: "Raspberry Kiss & Bliss"
My family and I stayed in Raspberry Kiss and it was beyond what we could have imagined! The house is so beautifully decorated and warm with all the essentials of home. Home was very clean and housekeeping and the grounds men are on POINT. With less than a 3 minute walk to the beach I would highly recommend this vacation spot to anyone. We will definitely be going back very soon. BEAUTIFUL PROPERTY AND WONDERFUL OWNER TO WORK WITH! We rented this for my family and I to stay for my wedding. It is such a beautiful and well kept property. Every room with a bathroom makes it perfect for multiple families. It was beautifully decorated and very clean. Great location! We had a wonderful time and the owner was great. She called when we arrived to make sure everything was acceptable. It was a great experience and we will certainly be back to celebrate our anniversary in the future! What a lovely home. It is nicely decorated, great mattresses, bathrooms and balconies in every room and was very clean. We had a two and four year old and found the pool to be perfect for their age. Easy beach access. COMMENTS from 2012 Summer Renters: "Raspberry Kiss & Bliss"
We have just returned from a wonderful week at Raspberry Kiss in Garden City, SC. The property was all that was advertised... easy walk to the beach, nice pool for relaxing, and great accomodations. We really liked that each bedroom had their own private bath. We had 5 adults and 5 kids but there was plenty of room for everyone. Kitchen and appliances were up to date, televisions all around, witha clean and well maintained home. The beach was at the end of the street and it is a quiet neighborhood too. We found the owners to be very responsive in the process and helpful in making it a great week. We are hoping to return next year and I would recommend this to my friends and family. Fran Coursey said... Great house, great location! I would highly recommend this house. Raspberry Bliss was beautiful; clean and very comfortable! It fit 13 of us very comfortably. The owners made the rental process very easy. The location of this house was perfect. It was great to have a pool at the house with the the beach just steps away. We were able to spend time at the ocean all day and when the kids got tired of it the rest of the day was by the pool. Shopping dining and activities were very close to the house. We had a great time! We would definitely come back here! Jason & Jen M.said... We loved this house! Plenty of room for everyone!! Plenty of room for everyone. Loved the five bedrooms and each with its own bathroom. Kitchen was great. All the balconies were so nice. Such a quick and easy walk to the beach for the kids. And the pool was perfect to play in as a family – morning, noon and night. We would love to come back: Thank you! Catherine and Dan A.said... Roomy, beautiful home with great pool!!! We loved your beautiful home and had a wonderful, relaxing vacation! The pool was perfect for the kids - big and small – to cool off in after a day at the beach, and the house was perfectly roomy for everyone to fit and cozy enough for late night games. Thank you! Peter K.said... Wonderfully relaxing week...PRICELESS! We had a wonderfully relaxing week! House was great. Afternoon dip in shaded pool delightful, and the Fourth [of July] fireworks from the decks without waiting in traffic or big crowds, PRICELESS! Wonderful time at the rental. It was beautiful inside and was just as it was described. The private pool was perfect for our family. The beach was really close and convenient. We were able to walk to a few places and the other great stuff was only a quick car ride away. There was shopping close by so we were able to grocery shop for the week and not eat out. It was great for each bedroom to have a private bathroom and gave our additional guest privacy. We will be staying again next year and would recommend it to our friends! Thank you! My family and I had a wonderful time in this beautiful rental property. The accommodations were absolutely wonderful. I would highly recommend this home to anyone interested in beach rentals. The furnishings, decorations and fully-stocked kitchen and utility room made this property far superior to most. 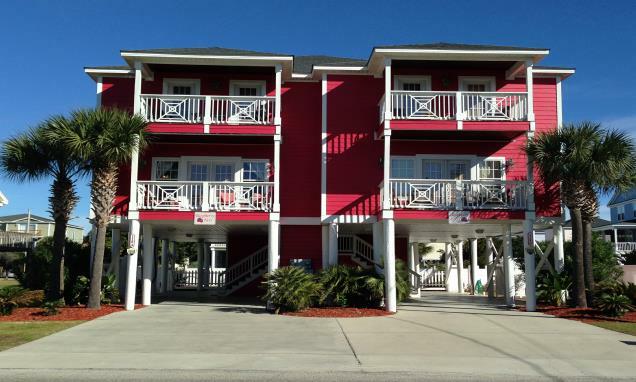 The location is perfectly situated between the fine restaurants at Murrells Inlet and the activities at Myrtle Beach. Doris P.
This home was stocked better than any we had ever stayed in. It had everything. Pool is small if "everyone" is in it at once, but that never happened with us, so it was adequate. A bit further south than we are used to staying, but since we were off season, traffic was NOT an issue.... Great time for all! DONT MISS YOUR OPPORTUNITY TO RENT THESE LUXURY HOUSES ONLY FEET FROM THE WATER'S EDGE. Comments from 2015 & 2016 Summer Renters: "Raspberry Kiss & Bliss"
The layout of this vacation rental is great for a large family and has a very equipped kitchen. My family rents a home each year and spend a week together at the beach! We loved the location of home. It was an easy walk to the beach. The house was perfectly outfitted with everything you could possibly need. The owners were wonderful to work with and we got the pleasure of meeting and talking with them. We would definitely rent this home again. Our family of 6 adults and 4 children recently stayed at Raspberry Kiss. The home was as described and pictured. Everything was very clean and very beautifully decorated. Each bedroom was comfortable and a big plus for each to have its own bath. The kitchen was well stocked with items needed and it was a plus to have the separate ice maker for our large group. The private pool was perfect for our family. The owners were very accommodating to meet our needs with a pack-n-play and high chair. The owners checked in on us upon our arrival, and left a bottle of wine and Krispy Kreme gift card - very thoughtful! The caretaker was very nice and came by and introduced himself to let us know he was available for any needs. Our family felt right at home at Raspberry Kiss and would definitely rent again! I recently rented Raspberry Kiss for a long needed vacation and a week of family time. The house is exactly as pictured. It is beautifully decorated, clean and ready to enjoy. There was a well stocked shelf of videos for the younger set, Netflix and an abundance of televisions throughout. the kitchen had everything we needed and the laundry room was handy and easily accessed. We had everything we needed to just sit back and relax. The owners were very accommodating and easy to work with. They have a lovely home which I really enjoyed being able to use for the week. The location is great. Definitely would rent again for another family vacation. The owners are so very nice, as is their caretaker who stopped in after we arrived to check on us. They left a bottle of wine for us on the counter (which was pretty good). The house was great, and nicely decorated with a view of the beach from a couple of balconies. It was a little cool on a couple of nights, so the pool heater was a nice option. 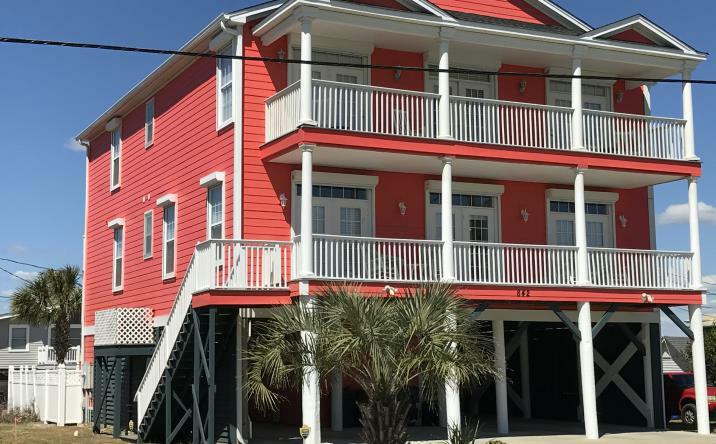 It's located in Surfside, so it's a quick trip to tons of great eating in Surfside and in Murrells Inlet, and just a quick walk across the street to the beach. Overall a great experience and everyone in our party loved the house! We loved our stay at Raspberry Bliss! The house was beautiful and clean. The owner was detailed oriented, attentive, and very easy to deal with. Upon entering the cottage, we saw a bottle of wine and a gift card to Krispy Kreme on the kitchen counter left by the owners. How thoughtful and delicious! The owners are very accommodating and easy to work with. Everything was immaculate and very homey. There was plenty of room for our family reunion. We particularly appreciated that each of the five bedrooms had their own bathrooms and balconies. And we thoroughly enjoyed relaxing in the pool after a day at the beach. The open floor plan of the kitchen/dining/living room was perfect for our crowd. The laundry room was a big plus as well. Plenty of room for parking, even with a storage pod on top. A very short walk to the beach made it easy to come back to the cottage for lunch or potty stops. Great neighborhood for walks in the morning before the day gets too hot. (Only downfall I can see is there are a lot of stairs, so the weak kneed may have some difficulty.) We would love to come back to this cottage for another family reunion in the future. We highly recommend Raspberry Kiss! We had an amazing vacation at raspberry bliss! The home is beautifully decorated and very clean. We had plenty of room for 12 people. The kitchen is fully stocked with everything you would need for cooking. The beach is so close and it was also great having our own pool. We will definitely be back! July 2015 - Very Nice House! Raspberry Bliss was the perfect house for our family! The house is very well maintained and professionally decorated. It is quite obvious the owners take pride in their house. Our first night the air conditioning wasn't cooling as expected so we contacted the owners . It wasn't too long after that when we received a phone call from the owner telling us the repairman was on his way! We sure did appreciate their prompt response! The kitchen was stocked with plenty of pots and pans for cooking along with a variety of spices. The beach is just a short walk away. Our family had a wonderful time! June 2015 - WONDERFUL TRIP! We had the pleasure of taking a trip with our entire family to celebrate my in-laws 40th wedding anniversary and Raspberry Kiss couldn't have been a better spot for our family! We had 6 adults and 5 kids and it was just perfect! There was plenty of room for all of us and it was great to have the pool. The home was beautiful and very well kept! The property owners/manager were wonderful. Upon arrival we received a phone call from the owners to make sure everything was great and I just thought that was exceptional customer service and so thoughtful to call and check on us! If I ever head back to Garden City, SC this is where we'll be staying! Thank you again! My entire family - 7 adults and 5 children - just got back from a fabulous stay at Raspberry Bliss. I really can't say enough good things about this home! You can tell that the owners put tons of love and TLC into it - there are lovely personal touches everywhere. We especially liked the housewarming-style bottle of wine left on the counter for us! The house is a very short walk to the beach, which we loved. The pool was great fun for the kids. All of the bedrooms were roomy and spacious - it's nice that the bunkbeds are a twin on top and a double on the bottom, as we were able to fit two (small) children into a double together. The kitchen was very well-appointed, with loads of equipment, pots and pans, utensils, and anything else you'd need for cooking. We also made use of the outdoor BBQ grill, which also comes with utensils. Oh, and my brother said to make sure to mention that the water pressure in the showers is fantastic! Thanks SO MUCH for making our vacation memorable! I'd recommend Raspberry Bliss to anyone! The rental property was everything advertised and then some. Not only was the house nicely decorated and comfortable, the house is located in a great location, very accessible to the beach, to local activities, shopping, and restaurants. Moreover, the owner was absolutely wonderful to work with, which made our vacation perfect. Just got home from an amazing weekend in Garden City. My group of girlfriends and I were extremely impressed with Raspberry Kiss! The home was beautiful and had fantastic amenities. We are already talking about planning our next trip. I highly recommend this home for your next vacation!!! Raspberry Kiss on the left. Raspberry Bliss on the right.